The grasshopper, a frothy green cocktail made with crème de menthe, crème de cacao, and cream, was supposedly invented at Tujagues restaurant in New Orleans in the 1950s. Given the sweet, creamy nature of the drink and the affinity between mint and chocolate, it wasn't much of a leap for enterprising dessert lovers to morph the grasshopper into various confections such as pies, ice cream shakes, and layered brownies. There are lots of recipes for grasshopper brownies, but you can't go wrong with this one. First, instead of a boxed mix, as so many recipes start with, it uses from-scratch brownies—easy to make and so much tastier than the commercial stuff. Depending on how pervasive you want the mint flavor to be, you can add peppermint extract to the brownie layer or keep it as a strictly chocolate foil to the creamy mint frosting. The frosting includes cream cheese, which gives it a rich, mellow character, and the ganache topping is simple and straightforward. Though there's no liqueur in the recipe, these grasshopper brownies are cool, rich, and minty tasting, everything a good grasshopper should be. Cut in small squares or large shapes, these bars are the perfect finish to a meal. 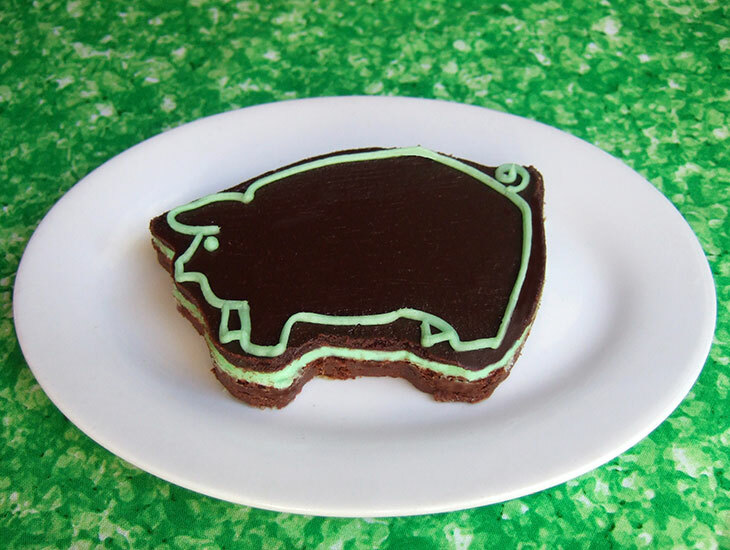 My favorite shapes for Grasshopper Brownies include the Pig cookie cutter, the Holly Leaf cookie cutter, and the Frog cookie cutter.